When I was a teenager I keep the frozen squid in the deep freeze, taking it out in the morning at breakfast to let it thaw in time for the evening's meal. I prefer to eat a massive amount of this, and nothing else, rather than have it more meanly as a starter. One of my first and favorite seafood dishes that I enjoyed as a newly married couple was calamari. 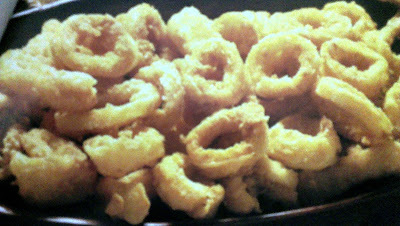 In particular, fried calamari.Whenever I’m dining out and I have a craving for fried calamari, I feel cheated when the plate is full of just the rings.The tentacles are the best part of the calamari. Oh sure, the rings are delish but the tentacles? Divine but my hubby doesn't really into squid but will for my happiness sake. As you guessed- I wanted to get my hands on this at my own kitchen and failed to get the crispiness rite on many occasion. One of friend told me to dredge the squid in seasoned flour and then give them a quick dunk in ice-cold water and the squid get dropped into the waiting hot oil. Well I can feel that look on your faces while reading and I know what you’re thinking…oil and water aren’t a happy pair and it’s true but this method works but the result is a delicious, crisp batter enveloping the tender cooked squid. After many experiments -I recreate this crisp, fried effect without worrying about hot oil dancing around the kitchen as it hits some water. Mixture of corn flour and all-purpose flour mixed with some corn starch. That’s it – corn starch! I will never worry about spitting oil hitting me whilst frying up some seafood or in this case, calamari. Every restaurant uses a different coating or batter for deep fried calamari. Personally, I prefer calamari that is crispy, but very lightly coated so that you can enjoy the subtle taste of the squid. I've made this several times now and it always works – as long as you watch the temperature of the oil carefully. In a heavy skillet on medium to medium-low heat, brown the salt and Szechuan peppercorns, shaking the pan occasionally, until the peppercorns are fragrant and the salt turns a light brown color. Remove from the heat. Cool. Use a mortar and pestle to grind the cooled mixture or grind in a blender. Set aside. Drain the squid and keep aside. In a small bowl, stir the egg into the ice water. Stir in the flour to form a thick, lumpy batter, being careful not to overmix (the batter should resemble a pancake batter).Heat the oil in a heavy bottom wok . Dip the squid into the tempura batter, using your fingers to coat the squid pieces. Add the squid and deep-fry until golden brown and crispy. Drain. 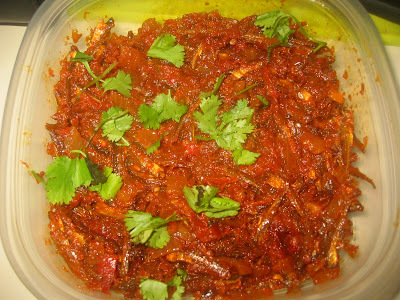 Serve garnished with the coriander leaves, and with the salt and pepper mix for dipping. 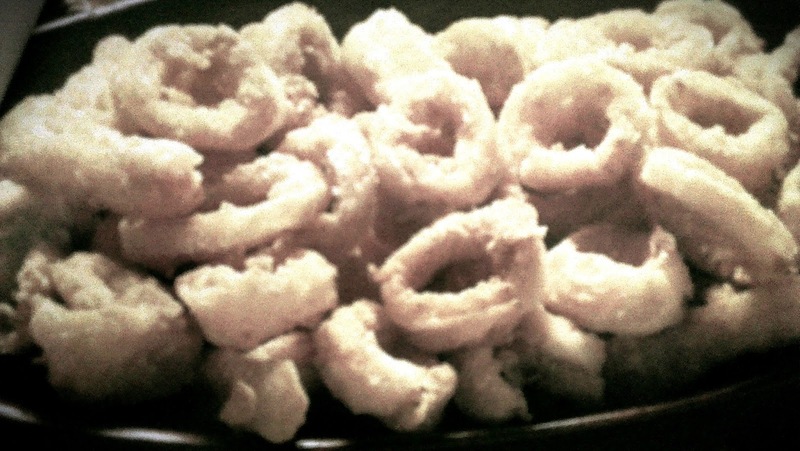 Note: Marinating the squid in buttermilk defeats the rubber band effect some fried calamari tends to have. It also helps create a light, crisp batter and more flavorful calamari. slurp, drooling here rite now, very tempting snack..
lovely dish, i too like squid fried in this form, but I always make it the same way as prawn fry.but you ae right it becomes a little rubberry when cooked for a long time.